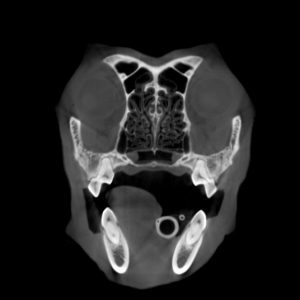 Pet CT scans are an advanced imaging technique that sit alongside our X-Ray and Ultrasound facilities to allow us to obtain high-quality, diagnostic images. It is a non-invasive technique that allows us to see inside your animal, and is exceptionally useful when diagnosing and treating soft tissue and orthopaedic injuries and diseases. The scanner provides a complete 3D picture of your pets bones, organs and vessels. The additional information provided by 3D images is incredibly useful for assessing complex conditions, and allows for effective planning of procedures such as complicated fracture repairs. Pet CT scans are performed at our Bolton 24/7 Clinic, where patients are anaesthetised before entering the scanner to make sure they keep still. A full scan typically takes between 5-15 minutes, where a nurse monitors the patient closely using advanced anaesthetic monitoring equipment. Once the scan is completed, the patient is allowed to recover under supervision, and is usually able to go home a few hours later. The data we obtain is used to construct a series of 3D images, which are immediately sent to a specialist for interpretation. We usually receive a full report with 24 hours and will contact you with the results and to discuss next steps, or if you have been referred from another vets, can provide that report directly to your usual, local, veterinary surgeon. Having such advanced imaging in our hospital allows us to avoid any delays in the diagnosis of a problem, and supports Animal Trust’s vision of providing accessibility to high quality veterinary care for all.